More than a dozen tax cuts are set to expire Dec. 31 and a couple of new taxes are scheduled to start with the new year. Combined, they would affect nearly 90 percent of taxpayers, from the very richest to the very poorest, with the typical household’s tax bill rising by about $2,000 in 2013, according to the nonpartisan Tax Policy Center. 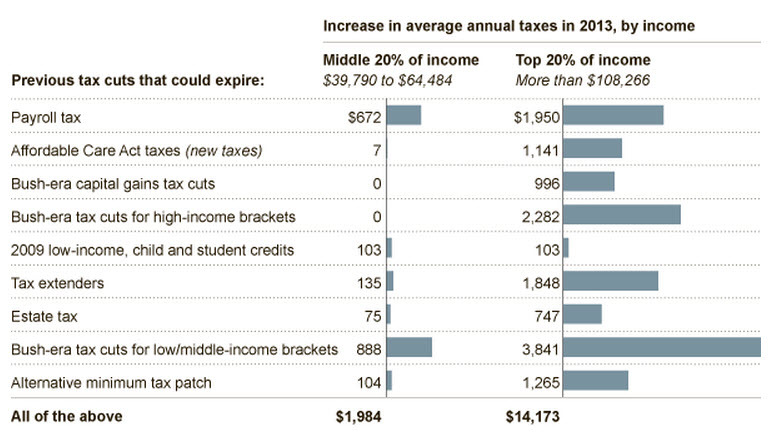 Taxes on one-percenters would rise an average of $121,000.
. . . While legislators are expected to try to reverse or temper many of the scheduled tax increases, at least a few appear to be a certainty. Accountants and tax lawyers are expecting a flurry of frantic calls in the last few weeks of this year as clients rearrange their affairs to minimize the blow.